Part A. Bacteria 1. Where are we in the exploration of Escherichia coli translocation pathways? (B. Wickner). 2. Components involved in bacterial protein translocation (C. Harris, P.C. Tai). 3. Molecular characterization of Sec proteins comprising the protein secretory machinery of Escherichia coli (S. Mizushima, H. Tokuda, S. Matsuyama). 4. Distinct steps in the insertion pathway of bacteriophage coat proteins (A. Kuhn, D. Troschel). 5. Steps in the assembly of a cytoplasmic membrane protein - The MalF component of the maltose transport complex (B. Traxler, J. Beckwith). 6. Structural characteristics of presecretory proteins: Their implication as to translocation competency (S. Mizushima, K. Tani, C. Hikita, M. Kato). 7. Sequence determinants of membrane protein topology (G. von Heijne). 8. Lipid involvement in protein translocation (B. de Kruijff, E. Breukink, R.A. Demel, R. van 't Hof, H.H.J. de Jongh, W. Jordi, R.C.A. Keller, J.A. Killian, A.I.P.M. de Kroon, R. Kusters, M. Pilon). Part B. Endoplasmic reticulum 9. Membrane protein insertion into the endoplasmic reticulum - signals, machinery, and mechanisms (S. High, B. Dobberstein). 10. Translocation of proteins through the endoplasmic reticulum membrane: investigation of their molecular environment by crosslinking (E. Hartmann, T.A. Rapoport). 11. The role of GTP in protein targeting to the endoplasmic reticulum (C. Ogg, J.M. Nunnari, J.D. Miller, P. Walter). 12. Consecutive steps of nucleoside triphosphate hydrolysis are driving transport of precursor proteins into the endoplasmic reticulum (P. Klappa, G. Müller, G. Schlenstedt, H. Wiech, R. Zimmermann). Part C. Vacuoles 13. Mechanisms and regulation of import and degradation of cytosolic proteins in the lysosome/vacuole (H.-L. Chiang, R. Schekman). 14. The sorting of soluble and integral membrane proteins to the yeast vacuole (C.K. Raymond, C.A. Vater, S. Nothwehr, C.J. Roberts, T.H. Stevens). Part D. Peroxisomes 15. Defining components required for peroxisome assembly in Saccharomyces cerevisiae (J. Höhfeld, D. Mertens, F.F. Wiebel, W.-H. Kunau). 16. Structure and assembly of peroxisomal membrane proteins (J.M. Goodman, L.J. Garrard, M.T. McCammon). 17. Mechanisms of transport of proteins into microbodies (S. Subramani). 18. Lessons for peroxisome biogenesis from fluorescence analyses of Zellweger syndrome fibroblasts (P.B. Lazarow, H.W. Moser, M.J. Santos). Part E. Mitochondria 19. The mitochondrial protein import machinery of Saccharomyces cerevisiae (V. Hines). 20. Protein insertion into mitochondrial outer and inner membranes via the stop-transfer sorting pathway (G.C. Shore, D.G. Millar, J.-M. Li). 21. General and exceptional pathways of protein import into sub-mitochondrial compartments (R. Lill, C. Hergersberg, H. Schneider, T. Söllner, R. Stuart, W. Neupert). Part F. Cloroplasts 22. Targeting of proteins into and across the chloroplast envelope (H.-M. Li, S.E. Perry, K. Keegstra). 23. Transport of proteins into the thylakoids of higher plant chloroplasts (C. Robinson). Comparison of two different protein translocation mechanisms into chloroplasts (J. Soll, H. Alefsen, B. Böckler, B. Kerber, M. Salomon, K. Waegemann). Part G. Chaperones 25. DnaJ homologs and protein transport (T. Kurihara, P.A. Silver). 26. Chaperonin-mediated protein folding (A.L. Horwich, S. Caplan, J.S. Wall, F.-U.Hartl). References. Index. This book provides a comprehensive overview of recent developments in the fast moving field of protein transport across and into intracellular membranes. The soluble and membrane-bound components assisting in these processes are introduced, and their functions described. Besides a detailed analysis of protein translocation across the bacterial plasma membrane, the mechanisms of protein targeting within the eukaryotic cell are discussed with special focus on the transport of proteins to the endoplasmic reticulum, vacuoles, peroxisomes, mitochondria, and chloroplasts. 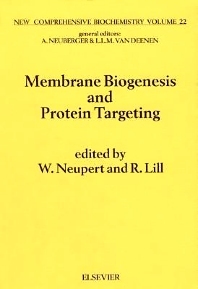 Providing stimulating hypotheses and models, the book is well suited for advanced students, graduate students, and for newcomers to the field seeking a general, yet accurate introduction to present knowledge in membrane transport of proteins.